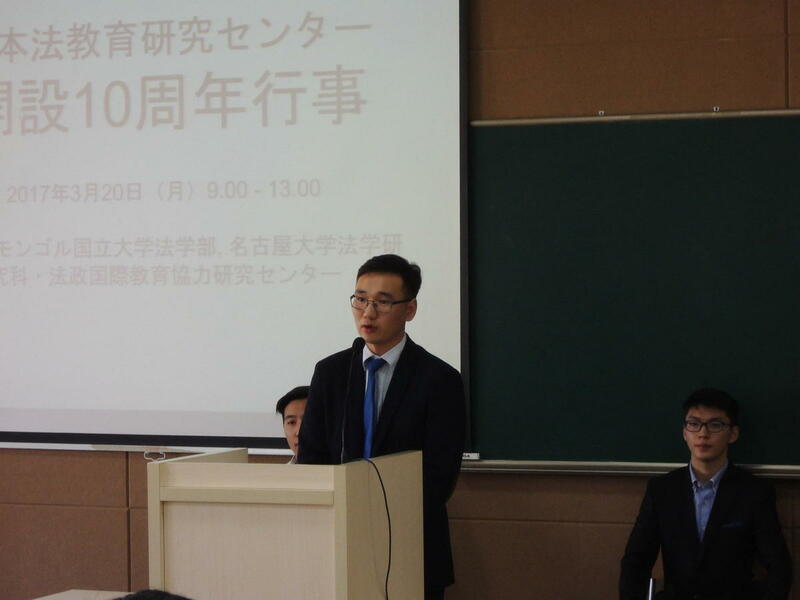 The Nagoya University Research and Education Center for Japanese Law (CJL) at the National University of Mongolia held a ceremony last March to commemorate ten years -- since fall 2006 -- of teaching Japanese law in the Japanese language. While attending the ceremony in the Mongolian capital of Ulaanbaatar, I was particularly struck by the quality of the students' speeches. While the speeches by representatives of the host university and special guests were provided with interpretation, the students provided their own, alternating frequently between Mongolian and Japanese. The first to take the stage was S. Bat-Orshikh, a fourth-year student. 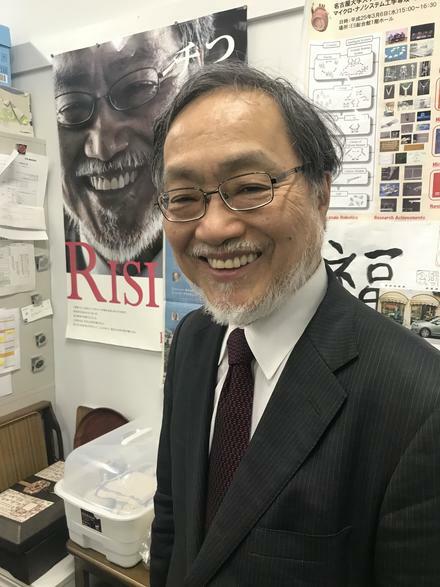 "By studying both Japanese and Mongolian law, I have acquired a habit of thinking critically," he said, before observing, "I used to think I was the center of the universe. I've come to realize that that certainly is not the case, and that there's value in knowing and correcting my weak points." L. Amgalanbaatar, also a fourth-year student, commented, "I've developed the ability to view Mongolia's legal system from a relative standpoint." D. Gankhurel, who is in his fifth year, the highest grade in Mongolia's five-year universities, said, "I thought Mongolian law was correct, but I've learned that that's not necessarily true." He went on to describe his experiences with Japanese culture. All three agreed that studying the two country's laws gave them a new perspective on the world. While listening to their speeches, I became convinced that acquiring such a broadened mindset is one of the main purposes of higher education. I couldn't help but wonder how many university students in Japan have acquired that and can also articulate it in an English speech. 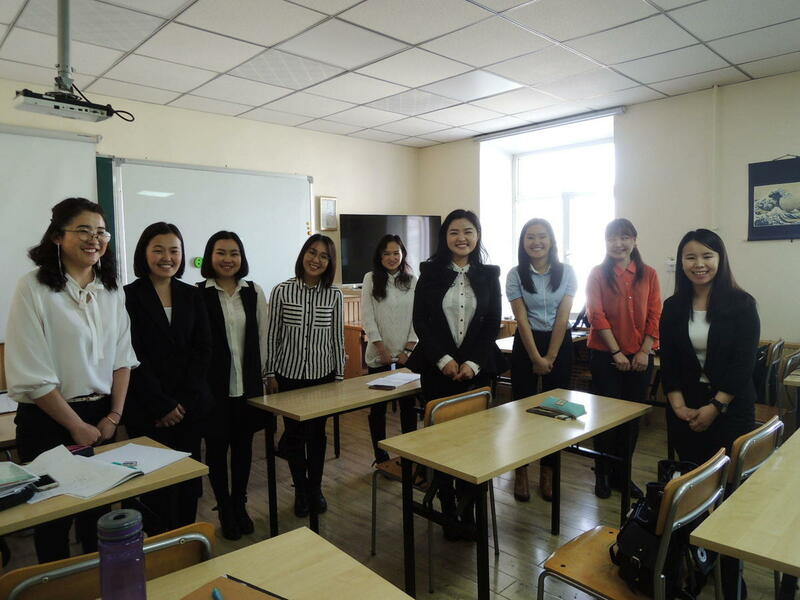 Not surprisingly, these students are among the top in intellectual excellence in Mongolia. Studying Japanese law in the Japanese language while also attending the National University of Mongolia School of Law full-time demands a workload far heavier that of ordinary law students. In fact, many students drop out of the program due to its rigor. 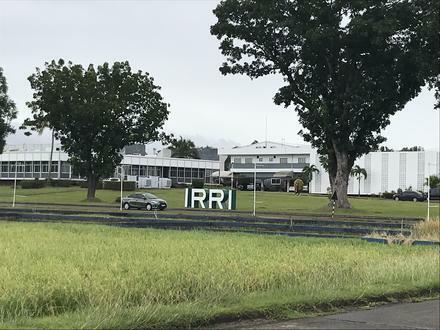 Their current numbers illustrate this: There are 16 first-year students, 9 second, third, and fourth-year students, and 4 fifth-year students. And yet what an impressive Japanese! It reminded me of the time I observed a class at CJL in Cambodia. As the students discussed law in Japanese, I noticed the hiragana posters on the wall and could hardly contain my amazement that they all started from that point four years previously. As mentioned in my previous post, "The Little School of Law's Big Asia Assistance Program," CJL students study social context to support their understanding of Japanese law. This approach has served to accelerate their language learning, with many outcompeting even Japanese majors in speech contests. Such outcomes have even impacted discussions about the future of Japanese language education. 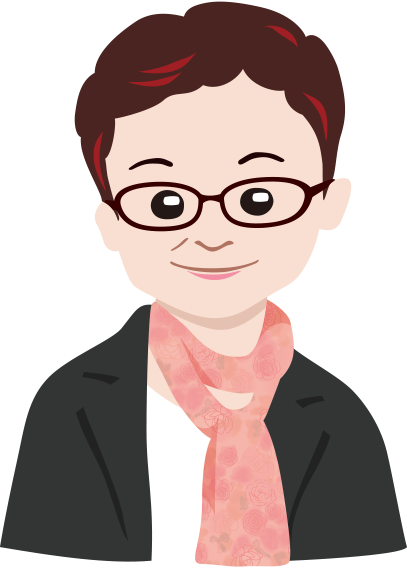 So how does CJL teach Japanese, widely considered one of the world's toughest languages? 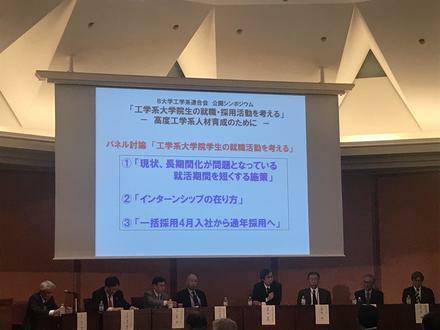 I asked this question of Assistant Professor Ryoko Miyajima, who led development of the program for teaching Japanese law in Japanese and was its supervisor until last March. I would like to report on our conversation while focusing on language education. Miyajima's involvement in the program began in 2008, when she moved to Cambodia to assume the task of launching a new CJL location there. 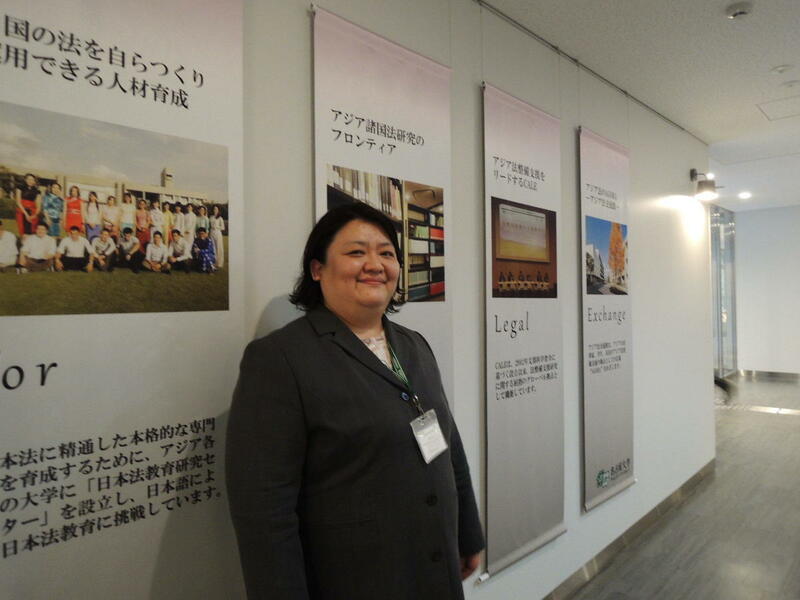 Though CJL already had locations in three other countries, including Mongolia, the new program would be the first to teach Japanese law in the Japanese language. As there was no concrete plan for doing this, however, every aspect of CJL's new project was experimental. Miyajima, who grew up in Nagasaki, came to Meidai after hearing a lecture by then Meidai Professor Kyoko Murakami in Malaysia, where Miyajima had been sent as a Japanese language instructor. In her lecture, Murakami commented: "Japanese teachers do a tremendous amount of studying to prepare for class, but it is students who need to study very hard." For Miyajima, it was eye opening. Looking back, she realized she had been overly preoccupied with teaching well. How do you motivate students to study diligently and with genuine interest? Intrigued by the idea of research, Miyajima entered Meidai graduate school. During her studies, she transferred to CJL in Cambodia, attracted by the rare opportunity of launching a new center. At the new center, students would be required to acquire enough Japanese language skill to study law in four to five years. There would be no time to use Japanese after studying it; the only option was to study while using it. She experimented with a design thinking approach that prioritized an understanding of the educational setting and involved teachers in the formulation of ideas. The education plan she devised followed the same type of thinking as a language teaching methodology called Content and Language Integrated Learning, or CLIL. This seemingly fancy jargon is just another way of saying what CJL does--teaching language and content at the same time. The key components of CLIL are Content, Communication, Cognition, and Community. According to Miyajima, being able to speak and write is not enough. The real goal is to gain enough language ability to present a logical and convincing argument. "CLIL is old and new," says Miyajima. "When learning from the West, Japan traditionally has studied language to understand content. We studied German to gain knowledge about medicine, for example." What is the curriculum at CJL like? Simply speaking, in the first year, students focus on Japanese. Since the workload is the same as, if not more than, students who major in Japanese, the number of dropouts is quite high at this stage. Students practice communicating for real life -- writing a self-introduction and posting it on a website, for example. This adds pressure that students can then rise to meet. When a law professor from Japan visits, the students are asked to introduce their country in Japanese. Every situation is taken as a learning opportunity. In the first semester of their second year, students begin to study Japanese society. Whether it's labor or education, the basic format is to always incorporate elements of law. This is continued in the second semester with Japanese history and civics, but here the focus is not on memorizing dates, but understanding the larger movements of how law has impacted society -- how the rules have changed with society and how those changes have led to today's laws. In the third year, legal studies begin in full force, and the Japanese curriculum transitions into supporting that understanding. Here again, students debate and write essays on chosen themes, and explain the laws of their home country in Japanese to law professors from Japan. Third-year students gain a deeper understanding that the meanings of words in two languages do not correspond perfectly, and also start to notice and learn about differences in legal concepts. The basic idea is to repeat this process of discovery in various ways. In their fourth year, students study mainly civil law. CJL students are busy, to say the least. "They really have improved. I have a deep respect for them," Miyajima says amiably. Only in the last year has Miyajima begun to publish the outcome of this approach. Working on the front lines of education tends to divert all one's energies toward the students, but taking the supervisor position has given her some leeway to write. There has been a widespread response. She has since been called to speak at workshops, and is sometimes received many comments from people at conference. One reason for this is the attention CLIL has recently been getting. CLIL is seeing growing acceptance in foreign language education. Sophia University, for example, adopted a policy to incorporate CLIL into all aspects of its English education, and made CLIL-based teaching skills a requirement in faculty employment. Nowhere else, however, has CLIL been fully integrated into Japanese language education. But this is beginning to change. Osaka University and other schools are now taking steps to incorporate CLIL thinking into their Japanese programs. "Looking back, it appears we've done some innovative things," reflects Miyajima. In Western countries that have incorporated CLIL into language education, all subjects are language education. Even language instructors are expected to be a specialist in something, and many instructors have two specializations. The idea seems to be that languages don't exist on their own, they exist because there's something to convey, and that language skills improve best when taught with content. The importance of Japanese language education for Japan, at home and abroad, goes without saying. Dramatic improvements are needed in both quality and quantity. For those from other countries living in Japan, acquiring Japanese language skills with content broadens career opportunities while also supporting their own self-realization. These individuals can also be powerful allies in Japan's current age of population decline. Miyajima also recognizes a tendency among Japanese language teachers to confine Japanese education to the classroom. Many are now moving toward a new Japanese education that engages with society and is more aligned with CLIL thinking. Last April, Miyajima moved to Nagoya University of Economics, where as assistant professor she will work to improve the quality of Japanese education. I wish her the best and hope her experiences at Meidai prove fruitful.